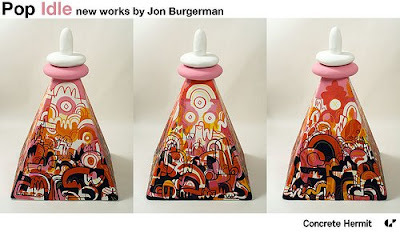 Jon Burgerman launches new work, including large sculptural pieces, at Concrete Hermit Gallery tonight. The exhibition will see new work including large sculptural pieces as well as prints and original pieces. The work featured will offer visitors a chance to worship and share private prayers with the idle Idols. Redemption, salvation and salivation are all promised. The show will also see the UK launch of his new 160 page monograph book entitled Gribba Grub published by Rojo.